New Look, New Website – Mobile and Tablet Friendly! It is with much excitement and after many, many months of hard work by my “family” of dedicated individuals, that I would like to introduce you to my new e-commerce website. Complete, with a stylish new look and feel, we’ve created a website which is mobile phone and tablet friendly. I invite you to explore. A site where art and design, combine with excellence in jewellery craft. We have created an affordable and safe environment for buying high quality fine jewellery on line and offer you an experience like no other. With a focus on exceptional design and customer service, my team will endeavour to make your experience on line no different than if you were to walk into the studio. 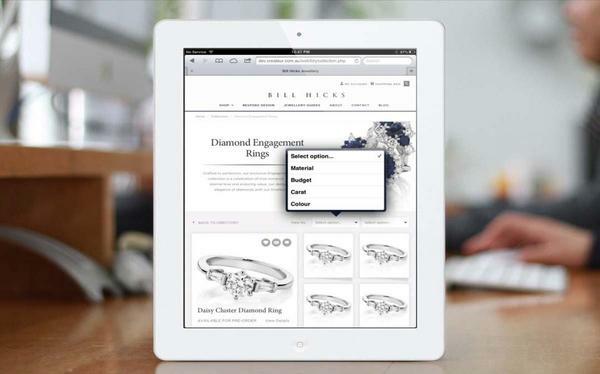 You can now shop from a collection of ready to wear precious pieces including engagement rings, dress rings, earrings, pendants and necklaces without having to leave home. I also have an extensive portfolio of designs on line available for you to purchase or customise to suit your taste, style and very importantly ….your budget. Every design on the website has been personally selected by me to appeal to the increasing and varied requirements by my clients to offer a range that reflects beauty, durability and affordability without compromise. My collections promise to offer something for every occasion – and if you can’t see it, we will make it for you. All of our custom hand made designs can also now be ordered on line. Ensuring the quality of your piece of jewellery is Colin, my head jeweller who takes immense pride in the quality of his work. His expertise in bringing my designs to life and hand making your piece is reflected in the portfolio section of the website where I have showcased some of his work, along side the stunning creations of my other jeweller, Emma, who likes to give her pieces ‘a womans touch’. The resulting launch of this amazing new website has been made possible by my family of enthusiastic people for whom I would like to thank. Firstly, my son Michal, and his company Createur, who is responsible for the artistic production and also happens to be the technical brains of the website …. Well someone has to be the geek mate !!! The hard work of many individuals along the way include the wonderful Emma, one of my jewellers, who had to leave the bench and moonlight tirelessly to ensure that what goes in the back end comes out the front end …. Sorry Em, a dirty job but someone had to do it!! And let’s not forget my gorgeous daughter, Charlotte ,“Relationship Manager” who ensured that what Michal needed that she and Emma provided – and in a timely fashion…. And you thought I was hard to manage !! and finally my partner, Alicia, for her support though out the process and who had to jump in at the deep end and find any gaps and cracks to ensure a smooth finish … is it any wonder her favourite pastime is renovating!! All in all I’m sure you will agree that the end result is fabulous. I do hope you will enjoy the website and recommend it to all your friends and family. I love designing… it’s what I was born to do. I look forward to sharing many more brand new ideas and designs with you on the site and make it your one stop shop for all your jewellery purchases whatever the occasion.